Have no fear, delicious. is here to dish out chocolate advice. Here are some golden rules. There is such an extensive range of chocolate available now that even Willy Wonka would be bamboozled by the choice. Of course, like most things, it is a matter of taste, so the following may help you choose the right chocolate to suit your cooking. Chocolate for eating should have a maximum of 70-75% cocoa solids as any higher tends to taste slightly bitter. Chocolate with a high cocoa content (85% or over) is great for baking. Bitter chocolate has a high proportion of cocoa solids (70-80%) and is quite bitter because it contains little sugar. So either enjoy it for this intense bitter taste or team it with something quite sweet. Bitter-sweet chocolate contains 60-70% cocoa solids and has a good balance of flavour between sweet and bitter. This is a good all-rounder for most recipes. Plain chocolate and has about 30-35% cocoa solids and a distinctly sweeter flavour. Milk chocolate varies between 20-40% cocoa solids and is best suited to light desserts requiring a mild chocolate flavour. Green & Black’s has an extensive range of chocolate that is great for both eating and cooking. Its cocoa beans come from different reputable origins and contain a high percentage of cocoa bean, as does Valrhona chocolate, which is favoured by chefs and chocolatiers. A good supermarket brand is Sainsbury’s Taste the Difference. If melting chocolate comes into contact with moisture or overheats, it will become grainy and separate or seize up into a solid mess. When melting chocolate in a bowl over a pan of simmering water, make sure the water doesn’t touch the bowl. The water should be just simmering, so as little steam and moisture is produced as possible. Be patient – it can take about 10 minutes. Smaller chocolate pieces will melt faster, so break up or grate it first. Freeze for 30 minutes to firm up before grating. Microwaving is an easy way to melt chocolate – just be careful it doesn’t burn. For 125g plain chocolate, microwave in a 900W oven on MEDIUM-HIGH for 2-3 minutes. For 125g milk chocolate, microwave on MEDIUM for 4-5 minutes. For 125g white chocolate, microwave on MEDIUM-LOW for 4-5 minutes. Check at intervals to avoid overheating. Never stir melting chocolate – wait until it has fully melted, then stir until smooth. If you want to add alcohol to chocolate, add it to the bowl with the solid chocolate pieces, melt, then stir in. If you stir it straight into melted chocolate, it will seize up. To store chocolate, wrap well and keep in a cool, dry place. If it becomes warm or humid, the cocoa butter in it will begin to crystalise, giving the chocolate a white, streaked surface known as ‘bloom’. This won’t affect the flavour or shine of the melted chocolate. Chocolate absorbs other pungent flavours, so store wrapped and away from other strong-flavoured foods. Allow melted or plain or milk chocolate to set in a cool place – not the fridge, where it can become sweaty looking and lose its shine. 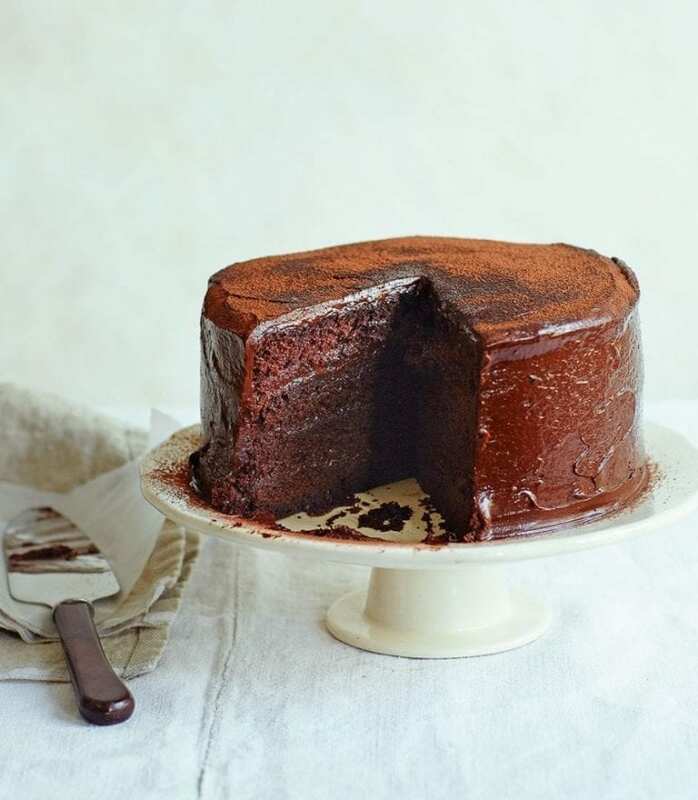 When making ganache (a chocolate mixture used to decorate cakes) to cover a 23-24cm cake, bring 225ml double cream to the boil, then add 350g broken up plain chocolate. Stir until the chocolate has melted and is mixed in and smooth. Cool until thickened, then spread over the cake. When you want to pipe melted chocolate, put some chocolate, broken up, into a small plastic freezer bag. Tie the end and place in the microwave and heat for 20 seconds bursts, until the chocolate has melted. Snip a small hole in one corner, then you have the perfect piping bag. Melt quality chocolate and pour on to a marble slab or a cool work surface. Use a palette knife to spread it evenly into a layer that’s not too thin. Leave in a cool place until just set, but not solid. (Don’t be tempted to put it in the fridge or the chocolate will set solid). Hold a large chopping knife carefully at both ends and drag the knife towards you at an angle, scraping off a thin layer of chocolate into a curl. After a few tries, you will get a feel for how set the chocolate should be to make perfect curls. Or for easy curls use a cheese plane instead of a knife which makes perfect curls. Keep the curls on a tray in the fridge then use to make show-stopping decorations.